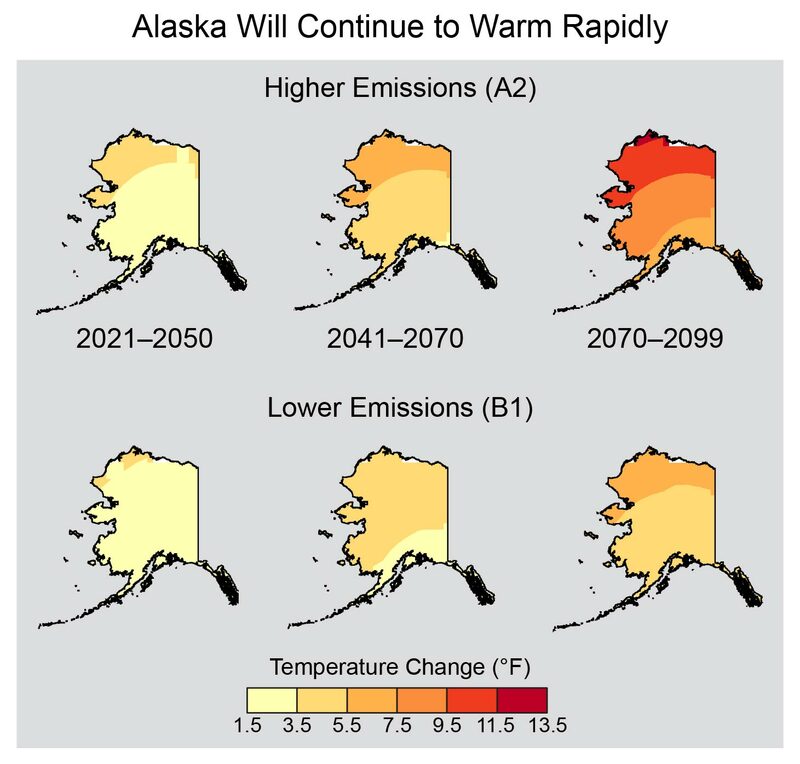 Alaska has warmed twice as fast as the rest of the nation, bringing widespread impacts. 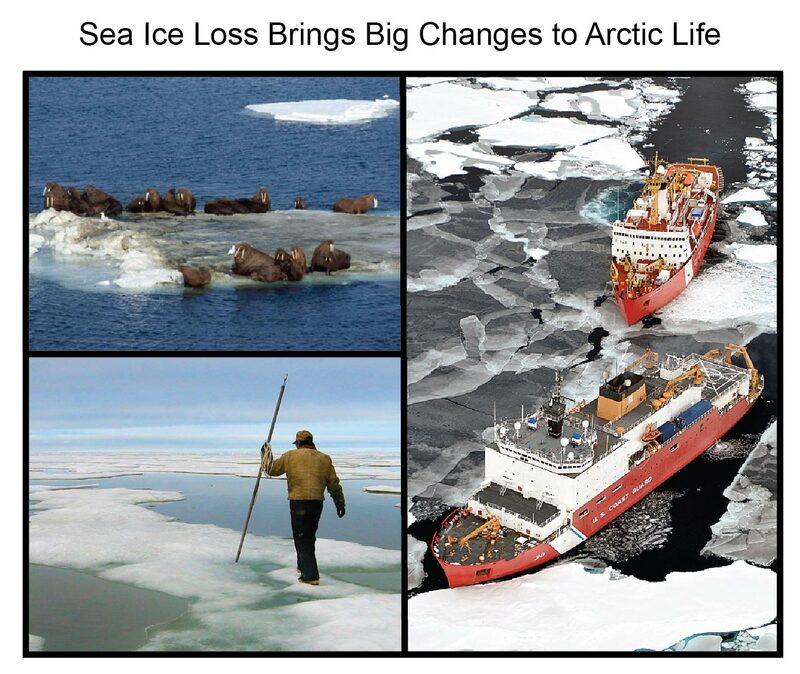 Sea ice is rapidly receding and glaciers are shrinking. 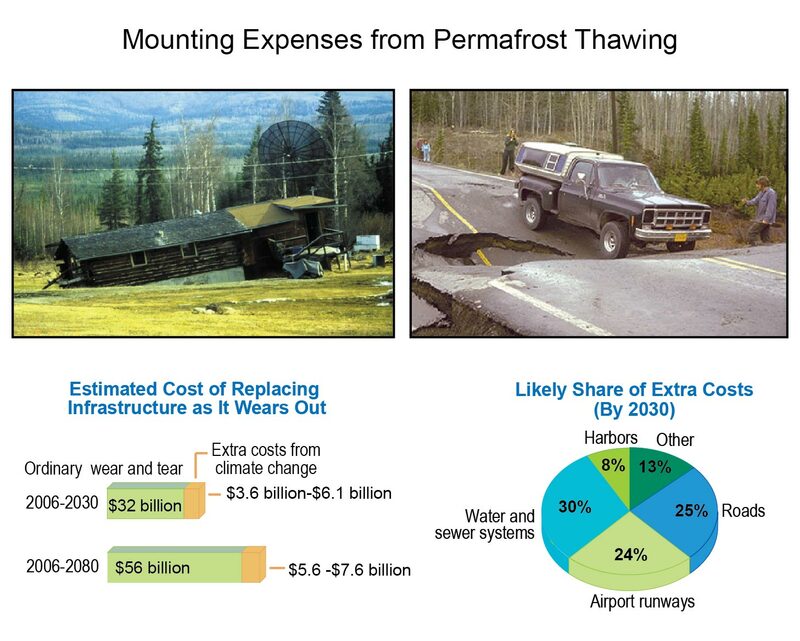 Thawing permafrost is leading to more wildfire, and affecting infrastructure and wildlife habitat. Rising ocean temperatures and acidification will alter valuable marine fisheries. Explore how climate change is affecting Alaska. Alaska is home to 40% (229 of 566) of the federally recognized tribes in the United States.171 The small number of jobs, high cost of living, and rapid social change make rural, predominantly Native, communities highly vulnerable to climate change through impacts on traditional hunting and fishing and cultural connection to the land and sea. Because most of these communities are not connected to the state’s road system or electrical grid, the cost of living is high, and it is challenging to supply food, fuel, materials, health care, and other services. Climate impacts on these communities are magnified by additional social and economic stresses. However, Alaskan Native communities have for centuries dealt with scarcity and high environmental variability and thus have deep cultural reservoirs of flexibility and adaptability. Because of its cold-adapted features and rapid warming, climate change impacts on Alaska are already pronounced, including earlier spring snowmelt, reduced sea ice, widespread glacier retreat, warmer permafrost, drier landscapes, and more extensive insect outbreaks and wildfire, as described below. A central component of the assessment process was the Alaska Regional Climate assessment workshop that was held September 12-15, 2012, in Anchorage with approximately 20 attendees; it began the process leading to a foundational Technical Input Report (TIR).5 The report consists of 148 pages of text, 45 figures, 8 tables, and 27 pages of references. Public and private citizens or institutions were consulted and engaged in its preparation and expert review by the various agencies and non-governmental organizations (NGOs) represented by the 11-member TIR writing team. The key findings of the report were presented at the Alaska Forum on the Environment and in a regularly scheduled, monthly webinar by the Alaska Center for Climate Assessment and Policy, with feedback then incorporated into the report. The chapter author team engaged in multiple technical discussions via regular teleconferences. These included careful expert review of the foundational TIR5 and of approximately 85 additional technical inputs provided by the public, as well as the other published literature and professional judgment. These discussions were followed by expert deliberation of draft key messages by the writing team in a face-to-face meeting before each key message was selected for inclusion in the Report. These discussions were supported by targeted consultation with additional experts by the lead author of each message, and they were based on criteria that help define “key vulnerabilities” (Ch. 26: Decision Support). The key message and supporting chapter text summarize extensive evidence documented in the Alaska TIR.5 Technical input reports (85) on a wide range of topics were also received and reviewed as part of the Federal Register Notice solicitation for public input. Although various models differ in the projected rate of sea ice loss, more recent CMIP5 models12 that most accurately reconstruct historical sea ice loss project that late-summer sea ice will virtually disappear by the 2030s, leaving only remnant sea ice. Evidence from improved models (for example,12) and updated observational data from satellite, especially new results, clearly show rapid decline in not only extent but also mass and thickness of multi-year ice,15 information that was not available in prior assessments. 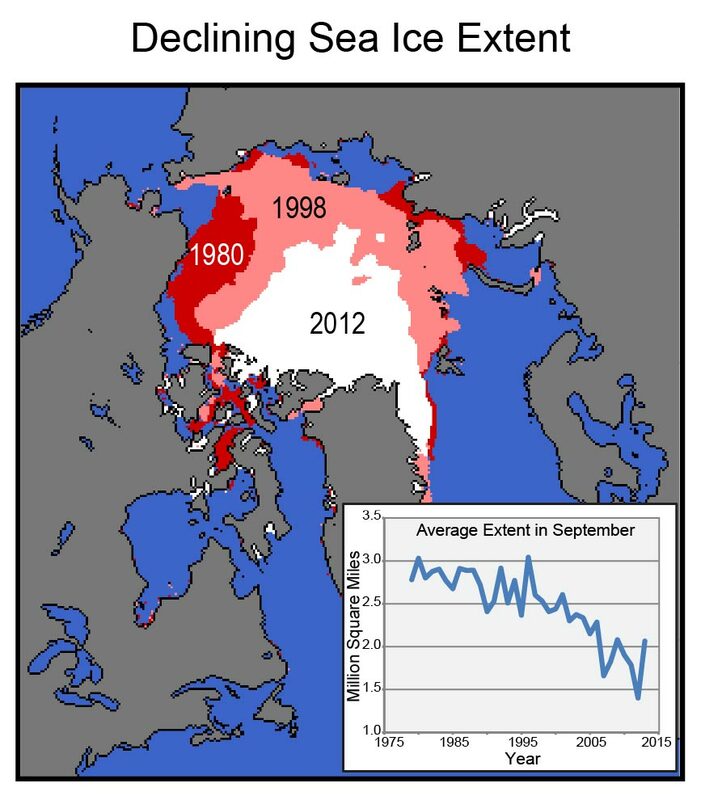 Nearly all studies to date published in the peer-reviewed literature agree that summer Arctic sea ice extent is rapidly declining and that, if heat-trapping gas concentrations continue to rise, an essentially ice-free summer Arctic ocean will be realized before mid-century. However, there remains uncertainty in the rate of sea ice loss, with the models that most accurately project historical sea ice trends currently suggesting nearly ice-free conditions sometime between 2021 and 2043 (median 2035).12 Uncertainty across all models stems from a combination of large differences in projections among different climate models, natural climate variability, and uncertainty about future rates of fossil fuel emissions. There is substantial new information that ocean acidification, rising ocean temperatures, declining sea ice, and other environmental changes are affecting the location and abundance of marine fish, including those that are commercially important, those used as food by other species, and those used for subsistence.16,17,18,19,20,21 However, the relative importance of these potential causes of change is highly uncertain. A key uncertainty is the price of fossil fuels. Viable avenues for improving the information base include determining the primary causes of variation among different climate models and determining which climate models exhibit the best ability to reproduce the observed rate of sea ice loss. There is new information that lack of sea ice causes storms to produce larger waves and more coastal erosion.5 An additional contributing factor is that coastal bluffs that were “cemented” by permafrost are beginning to thaw in response to warmer air and ocean waters, and are therefore more vulnerable to erosion.22 Standard defensive adaptation strategies to protect coastal communities from erosion such as use of rock walls, sandbags, and riprap have been largely unsuccessful.23 There remains considerable uncertainty, however, about the spatial patterns of future coastal erosion. Very high confidence for summer sea ice decline. High confidence for summer sea ice disappearing by mid-century. Very high confidence for altered marine ecosystems, greater ship access, and increased vulnerability of communities to coastal erosion. Arctic sea ice extent and thickness have declined substantially, especially in late summer (September), when there is now only about half as much sea ice as at the beginning of the satellite record in 1979 (Ch. 2: Our Changing Climate, Key Message 11).13,15 The seven Septembers with the lowest ice extent all occurred in the past seven years. As sea ice declines, it becomes thinner, with less ice build-up over multiple years, and therefore more vulnerable to further melting.15 Models that best match historical trends project northern waters that are virtually ice-free by late summer by the 2030s.25,26,12 Within the general downward trend in sea ice, there will be time periods with both rapid ice loss and temporary recovery,27 making it challenging to predict short-term changes in ice conditions. Walrus depend on sea ice as a platform for giving birth, nursing, and resting between dives to the seafloor, where they feed.46 In recent years, when summer sea ice in the Chukchi Sea retreated over waters that were too deep for walrus to feed,47,48 large numbers of walrus abandoned the ice and came ashore. The high concentration of animals results in increased competition for food and can lead to stampedes when animals are startled, resulting in trampling of calves.49,50 This movement to land first occurred in 2007 and has happened three times since then, suggesting a threshold change in walrus ecology. Newtok, a Yup’ik Eskimo community on the seacoast of western Alaska, is on the front lines of climate change. Between October 2004 and May 2006, three storms accelerated the erosion and repeatedly “flooded the village water supply, caused raw sewage to be spread throughout the community, displaced residents from homes, destroyed subsistence food storage, and shut down essential utilities.”54 The village landfill, barge ramp, sewage treatment facility, and fuel storage facilities were destroyed or severely damaged.55 The loss of the barge landing, which delivered most supplies and heating fuel, created a fuel crisis. Saltwater is intruding into the community water supply. Erosion is projected to reach the school, the largest building in the community, by 2017. Recognizing the increasing danger from coastal erosion, Newtok has worked for a generation to relocate to a safer location. 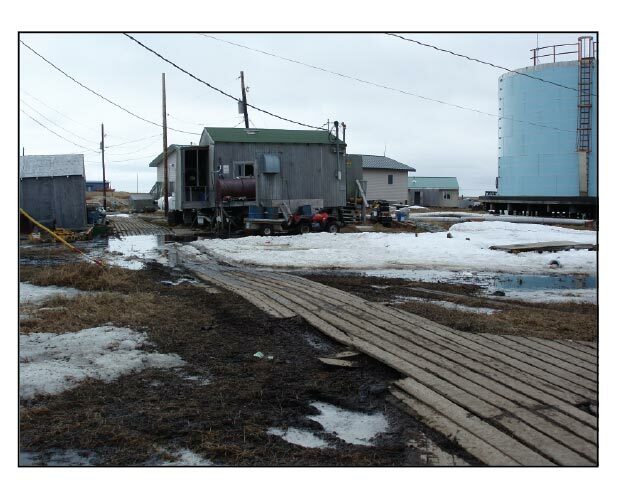 However, current federal legislation does not authorize federal or state agencies to assist communities in relocating, nor does it authorize them to repair or upgrade storm-damaged infrastructure in flood-prone locations like Newtok.51 Newtok therefore cannot safely remain in its current location nor can it access public funds to adapt to climate change through relocation. Most glaciers in Alaska and British Columbia are shrinking substantially. This trend is expected to continue and has implications for hydropower production, ocean circulation patterns, fisheries, and global sea level rise. The key message and supporting chapter text summarize extensive evidence documented in the Alaska Technical Input Report.5 Technical input reports (85) on a wide range of topics were also received and reviewed as part of the Federal Register Notice solicitation for public input. Glacial rivers account for 47% of the freshwater input to the Gulf of Alaska68 and are an important source of organic carbon,69,70 phosphorus,71 and iron72 that contribute to the high productivity of near-shore fisheries.70,73,74,75 Therefore, it is projected that the changes in discharge of glacial rivers will affect ocean circulation patterns and major U.S. and locally significant fisheries. As noted above, major advances from GRACE and other datasets now permit analyses of glacier mass loss that were not possible previously. Key uncertainties remain related to large year-to-year variation, the spatial distribution of snow accumulation and melt, and the quantification of glacier calving into the ocean and lakes. Although most large glaciated areas of the state are regularly measured observationally, extrapolation to unmeasured areas carries uncertainties due to large spatial variability. Although there is broad agreement that near-shore circulation in the Gulf of Alaska is influenced by the magnitude of freshwater inputs, little is known about the mechanisms by which near-term increases and subsequent longer-term decreases in glacier runoff (as the glaciers disappear) will affect the structure of the Alaska Coastal Current and smaller-scale ocean circulation, both of which have feedback on fisheries. The magnitude and timing of effects on hydropower production depend on changes in glacial mass, as described above. High confidence that glacier mass loss in Alaska and British Columbia is high, contributing 20% to 30% as much to sea level rise as does shrinkage of the Greenland Ice Sheet. High confidence that due to glacier mass loss there will be related impacts on hydropower production, ocean circulation, fisheries, and global sea level rise. Previous evidence that permafrost is warming80 has been confirmed and enhanced by more recent studies.81,82 The most recent modeling efforts (for example, Avis et al. 2011; Jafarov et al. 201283,84) extend earlier results85,86 and project that permafrost will be lost from the upper few meters from large parts of Alaska by the end of this century. Satellite data has expanded the capacity to monitor wildfire across the region, providing additional evidence of wildfire extent.89 This new evidence has led to increased study that is beginning to reveal impacts on ecosystems and wildlife habitat, but much more work is needed to understand the extent of natural resilience. This evidence included results from improved models and updated observational data. The assessment included insights from stakeholders collected in a series of distributed engagement meetings that confirm the relevance and significance of the key message for local decision-makers. Key uncertainties involve: 1) the degree to which increases in evapotranspiration versus permafrost thaw are leading to drier landscapes; 2) the degree to which it is these drier landscapes associated with permafrost thaw, versus more severe fire weather associated with climate change, that is leading to more wildfire; 3) the degree to which the costs of the maintenance of infrastructure are associated with permafrost thaw caused by climate change versus disturbance of permafrost due to other human activities; and 4) the degree to which climate change is causing Alaska to be a sink versus a source of greenhouse gases to the atmosphere. Very high confidence that permafrost is warming. High confidence that landscapes in interior Alaska are getting drier, although the relative importance of different mechanisms is not completely clear. Medium confidence that thawing permafrost results in more wildfires. There is high confidence that wildfires have been increasing in recent decades, even if it is not clear whether permafrost thaw or hotter and drier weather is more important. High confidence that climate change will lead to increased maintenance costs in future decades. Low confidence that climate change has led to increased maintenance costs of infrastructure in recent decades. Very high confidence that ecological changes will cause Alaska to become a source of greenhouse gases to the atmosphere, even though evidence that Alaska is currently a carbon source is only suggestive. Figure 22.5: Projections for average annual ground temperature at a depth of 3.3 feet over time if emissions of heat-trapping gases continue to grow (higher emissions scenario, A2), and if they are substantially reduced (lower emissions scenario, B1). Blue shades represent areas below freezing at a depth of 3.3 feet, and yellow and red shades represent areas above freezing at that depth, based on the GIPL 1.0 model. (Figure source: Permafrost Lab, Geophysical Institute, University of Alaska Fairbanks). 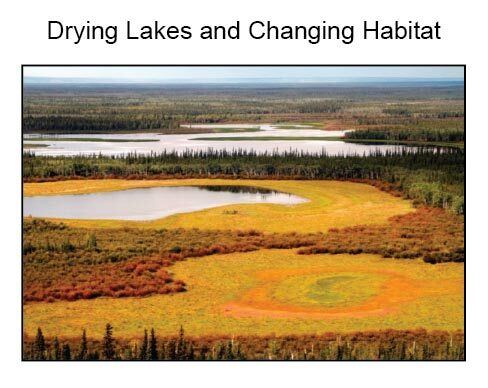 A continuation of the current drying of Alaskan lakes and wetlands could affect waterfowl management nationally because Alaska accounts for 81% of the National Wildlife Refuge System and provides breeding habitat for millions of migratory birds that winter in more southerly regions of North America and on other continents.104 Wetland loss would also reduce waterfowl harvest in Alaska, where it is an important food source for Alaska Natives and other rural residents. Numerous peer-reviewed publications describe evidence that ocean temperatures are rising and ocean chemistry, especially pH, is changing.5 New observational data from buoys and ships document increasing acidity and aragonite under-saturation (that is, the tendency of calcite and aragonite in shells to dissolve) in Alaskan coastal waters. The new evidence included results from improved models and updated observational data. The assessment included insights from stakeholders collected in a series of distributed engagement meetings that confirm the relevance and significance of the key message for local decision-makers. A key uncertainty is what the actual impacts of rising temperatures and changing ocean chemistry, including an increase in ocean acidification, will be on a broad range of marine biota and ecosystems. More monitoring is needed to document the extent and location of changes. Additional research is needed to assess how those changes will affect the productivity of key fishery resources and their food and prey base. High confidence of increased ocean temperatures and changes in chemistry. Medium confidence that fisheries will be affected. Ocean acidification, rising ocean temperatures, declining sea ice, and other environmental changes interact to affect the location and abundance of marine fish, including those that are commercially important, those used as food by other species, and those used for subsistence.16,17,18,122,19,20,21 These changes have allowed some near-surface fish species such as salmon to expand their ranges northward along the Alaskan coast.124,125,126 In addition, non-native species are invading Alaskan waters more rapidly, primarily through ships releasing ballast waters and bringing southerly species to Alaska.5,127 These species introductions could affect marine ecosystems, including the feeding relationships of fish important to commercial and subsistence fisheries. The changing temperature and chemistry of the Arctic Ocean and Bering Sea are likely changing their role in global ocean circulation and as carbon sinks for atmospheric CO2 respectively, although the importance of these changes in the global carbon budget remains unresolved. The North Pacific Ocean is particularly susceptible to ocean acidification (see also Ch. 2: Our Changing Climate, Key Message 12; Ch. 24: Oceans).135 Acidifying changes in ocean chemistry have potentially widespread impacts on the marine food web, including commercially important species. The precise mechanisms by which climate change affects Native communities are poorly understood, especially in the context of rapid social, economic, and cultural change. Present day responses to environmental change are poorly documented. More research is needed on the ways that Alaska Natives respond to current biophysical climate change and to the factors that enable or constrain contemporary adaptation. There is high confidence that cumulative effects of climate change in Alaska strongly affect Native communities, which are highly vulnerable to these rapid changes but have a deep cultural history of adapting to change. Alaska Native Elders say, “We must prepare to adapt.” However, the implications of this simple instruction are multi-faceted. Adapting means more than adjusting hunting technologies and foods eaten. It requires learning how to garner information from a rapidly changing environment. Permanent infrastructure and specified property rights increasingly constrain people’s ability to safely use their environment for subsistence and other activities.